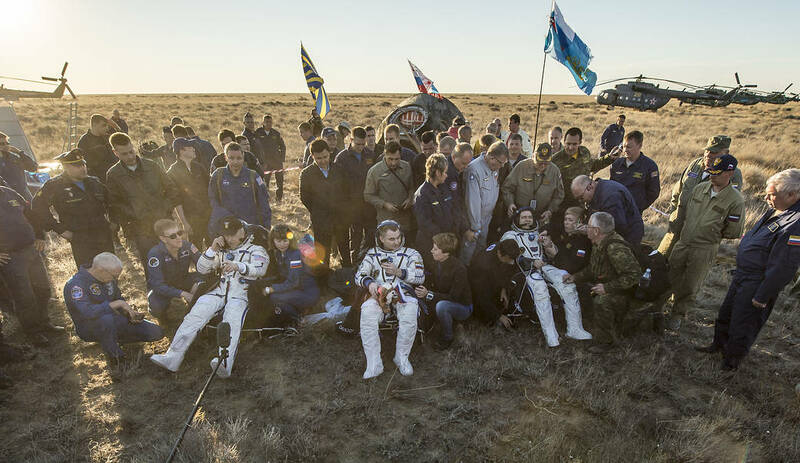 Expedition 48 crew lands safely on Earth. The Soyuz TMA-20M spacecraft carrying three crewmembers of the International Space Station (ISS) has landed in Kazakhstan, the Mission Control Center in the Moscow Region said on Sept. 7. Search and rescue groups have set off to the place of landing, they will evacuate crewmembers from the capsule, in particular Russian cosmonauts Aleksey Ovchinin and Oleg Skripochka, and U.S. astronaut Jeffrey Williams. Ovchinin, Skripochka and Williams went to the orbit on March 19 and spent 172 days in space. This was the first space flight for Ovchinin, second for Skripochka and fourth for Williams. Until the next Soyuz comes, Russian cosmonaut Anatoli Ivanishin, Japanese astronaut Takuya Onishi and US astronaut Kathleen Rubins will stay on the ISS. The next Soyuz spacecraft will fly to the ISS on Sept. 23. It will take Russian cosmonauts Sergey Ryzhikov and Andrei Borisenko, and U.S. astronaut Robert S. Kimbraugh to space. Read more: Has life in another star system contacted Russia?